We charge no annual fee to use our portal. We charge 0% commission on donations (excl. credit card fees ~ roughly 2.5% or 3.5% with PayPal). individual campaigns for the people you are helping. This adds a level of transparency and tangibility to your campaigns which research suggests promotes a higher rate of contribution. You can enable weekly, monthly or annual subscriptions or just one off donations. In contrast, some CLCs use donation portals such as Everydayhero which requires an annual fee of over $400/yr + 6.5% commission per transaction + the standard ~2.5-3.5% transaction fees. 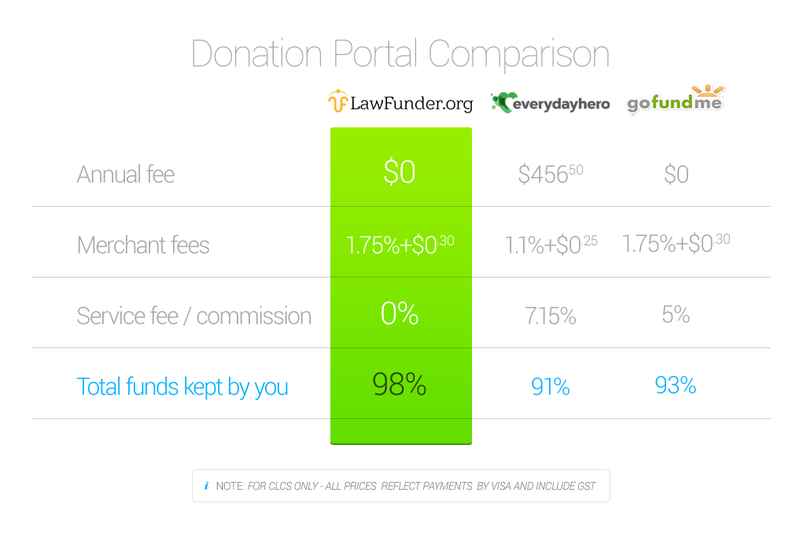 Another popular option, Gofundme, takes over 6.75% of your donations. Lawfunder recognises the tremendous work that CLCs do for our community and the severe financial constraints within which they do so. For this reason, we are currently working with the Queensland Association of Independent Legal Services to offer our innovative fundraising portal to all registered CLCs without any charge or commission by Lawfunder. For additional information, please see our Frequently Asked Questions or How it Works. Who do community legal centres help?